Sony Ericsson got its game on today at Mobile World Congress in Barcelona with the announcement of its Xperia Play gaming phone. After a showy product unveiling event, I got the chance to play awhile with the much-hyped new phone, and came away marginally impressed. Sony Ericsson hopes the long-awaited and much discussed gaming phone will wedge the company back into relevance in a smartphone market that's been dominated by HTC, Motorola, and Apple phones. "This is the best smartphone ever and will open up new possibilities for entertainment," said Rikko Sakaguchi, VP and "chief creation officer" at Sony Ericsson at the event. 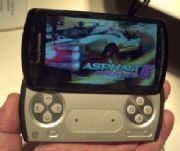 The Xperia Play is powered by Android 2.3 (Gingerbread). It features a slide-out panel containing the Sony gaming D-pad (for in-game direction control) on the left side, the four symbol-etched game control buttons on the right, and a set of circular touchpads in the middle, which act like analog joysticks for operating certain games. If you're used to on-screen gaming controls as I am, the physical gaming controllers on the Xperia Play may take some getting used to, but it's a much better experience. The controls were very responsive to the touch and their placement and functions seemed intuitive to me in the several games I played. The phone packs a 1GHz Qualcomm Snapdragon processor, and the display is a 4-inch Bravia (480 by 854 pixels FWVGA) touchscreen with an Adreno GPU graphics processor inside. The combined effect of these things is actually pretty impressive. The games I played here showed clearly defined 3D dimension and bright, vivid colors. Sony says the phone can do this while still going easy on the battery, but we'll have to test that later. The user interface of the phone has the familiar Android feel, but Sony Ericsson has built some of the function areas, like the music player. I was impressed with the onscreen keyboard, and had no trouble banging out some error-free text. I didn't much care for the curvy design of the phone, and I noted that some of the buttons on the side of the phone looked a bit cheap and plasticky. Nor did the phone feel solid in the hand in the way upper echelon smartphones feel. However, the phone weighs about as much and is about the same size as an HTC Nexus One. Xperia Play owners will get their games from a Playstation store. Games from several key titles will be available, such as EA's Need For Speed, Sims 3, and a world-first multiplayer version of FIFA 10 for mobile. GLU Mobile/Activision will be bringing Guitar Hero to the Xperia Play, Sony says. Gameloft brings Assassin's Creed and Splinter Cell. The games are downloaded to the phone, not played from the cloud. The Xperia Play is a CDMA phone (not LTE as I had hoped), so while Verizon's network is dependable, it is a 3G network and so is not likely to produce the upload speed and low network latency that's conducive to playing online games. Verizon Wireless, Sony says, will begin selling the new gaming phone this Spring. Pricing information has not been announced by either company.